Ever since I tried Mark Bittman’s recipe for black kale and black olive salad a few years ago, I’ve been a big fan of kale salad. So when I was invited to try out one of Aida Mollenkamp’s new recipes for her “Keys to the Kitchen” Virtual Dinner Party, I kept gravitating to the one for raw kale salad with heirloom tomatoes and roasted cashews. Here in Seattle we were lucky enough to bask in summer weather through the end of September, which means I’m still enjoying tomatoes from my mother-in-law’s garden. I was going to a dinner party, and I wanted to share some of these tomatoes with my friends. I also had a huge 4-pound bag of kale that I needed to use up. It was the perfect opportunity to make Aida’s recipe. Jennifer Lewis of SmallFoodBiz.com will lead a panel discussion with food truck entrepreneurs Molly Neitzel (Molly Moon’s), Josh Henderson (Skillet), and Marshall Jett (Veraci Pizza) at the University of Washington on October 17 from 12:30-1:30 pm. The talk is part of the UW’s Entrepreneur Week presented by the Foster School of Business. Food trucks will be open for business from 11 am – 2 pm on the Business Hall Promenade. The event is free and open to all UW students, faculty, staff, alumni and the Seattle entrepreneurial community. (So, basically, anyone.) Get more details on the Entrepreneur Week website. Here’s a video featuring Skillet that I shot on the fly for grad school. My classmates and I asked vendors at the Mobile Chowdown food truck festival how they use social media to promote their businesses. This video was made in 2010, and I’m struck by: 1) how “new” social media still seemed then, and 2) how big the Skillet empire has become in just two years. I had the pleasure of meeting food expert, writer, TV host, and culinary curator, Aida Mollenkamp, at a Seattle Food Blogger event hosted by the fabulous Keren Brown. Aida came to Seattle to promote her first cookbook, Keys to the Kitchen, which she described as a modern kitchen manual for people in their 20s and 30s. I don’t usually go into dimly lit bars in search of baked goods. However, last week, I found myself at the Twilight Exit in Seattle’s Central District looking for a man called “Uncle Peaches” and some cake. Anybody who has lived in Seattle for even a short period knows that it is not usually 70 degrees and sunny in October. 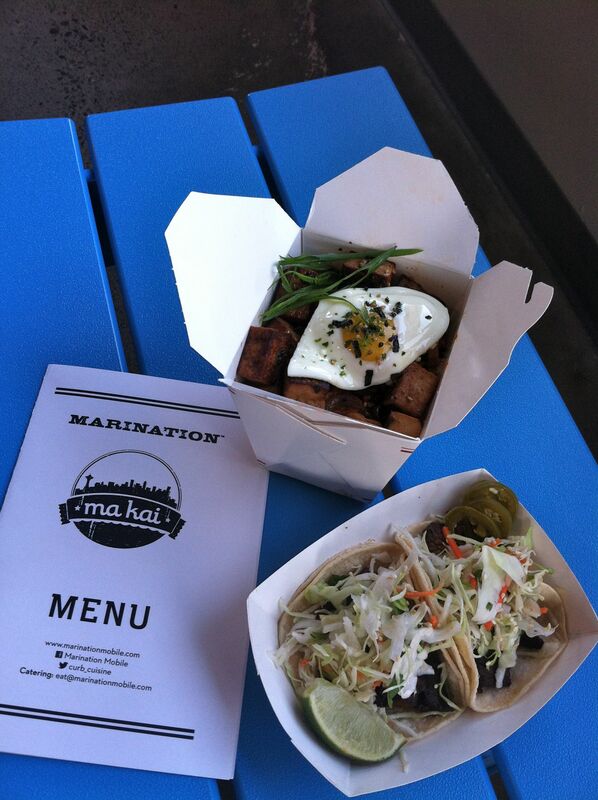 However, it appears that Seattleites will get a few more days of extended-play summer, and I can think of no better way to celebrate by visiting the new Marination Ma Kai.